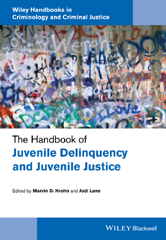 This interdisciplinary handbook offers an up-to-date examination of advances in the fields of juvenile delinquency and juvenile justice. The contributorsall leading scholars and practitionersprovide a current state of both fields, while also assessing where they have been and defining where they should go in years to come. 17 Social Learning Theory and Delinquent Behavior: Past, Present, and Future Investigations - L. Thomas Winfree, Jr.